Over at the excellent Winstonsdad’s Blog there is a celebration of the wonderful Maclehose Press, five years old this week apparently. As one of my many New Year’s Resolutions was to read more unknown authors from smaller presses, this seemed an ideal opportunity. Maclehose press was set up by Christopher Maclehose after he left Harvill; Harvill are probably the publisher who can take most credit for my interest in translated literature. Even now a glance at the back of their older books where they used to print a numbered list of all their publications makes me wonder about those I haven’t read yet. 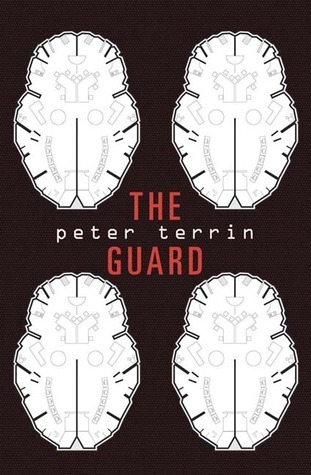 I chose The Guard, Peter Terrin’s first work to appear in English (translated form the Dutch by David Colmer, though Terrin is also described as “the Flemish winner of the 2010 European Prize for Literature”) as it had an interesting premise (and I was able to get a cheap second hand copy). The premise is: two guards never leave the basement of the building they are assigned to protect. The building is a block of luxury flats inhabited by the super-rich (servants are included in the rent). One day almost all the residents leave. They are followed soon after by the servants. (Some kind of apocalyptic event outside is postulated but never conformed). Only the guards remain resolute, ever alert in their daily routine, with no contact with the outside world to explain the exodus. Throughout this time much of their energy is focussed on waiting: they wait to be tested; they wait to be promoted to the elite guard; they wait for the third guard who might be sent to them. Like all novels based around waiting, the author has a choice as to whether it ends with nothing having changed or whether whatever is expected finally arrives. In this case the third guard appears half way through changing both the direction and tone of the novel. A slowly narrowing routine (that includes, for example, removing all the lights from the garage floor as they have learned their route in the dark) now becomes more dynamic. Eventually they begin to search the building for the one remaining resident. However, by this time the reliability of the narrator is severely challenged by the suspicion he might be insane. The reader increasingly suspects that not everything we are being told is actually happening. While the second half was still an engrossing read, I found it less interesting. In the first half we have a commentary on the separation of the rich from the rest of us, in the second half we discover that living in a confined space for months will drive you mad. As the guards search the upper floors, we also feel that the author is searching for an ending. The one he finds is not quite as satisfying as the novel’s opening will have you hoping for. You are currently browsing the archives for the Peter Terrin category.